In a bid to give Seattle's top pitching prospects as much consistency as possible in the second half of the season, the Mariners will flip-flop their Triple-A and Double-A pitching coaches once the All-Star break comes to an end. Mariners director of player development Chris Gwynn announced Monday that Jackson pitching coach Terry Clark will move to Triple-A Tacoma, with Rainiers pitching coach Dwight Bernard going to the Generals. The changes will be effective on Thursday with the beginning of the second half for both affiliates. "With the number of pitchers we have had move from Double-A to Triple-A this season, we believe this move will give us increased consistency in instruction," Gwynn said. "Both Dwight and Terry have done a fine job this season. We believe this move is best for the Mariners Organization at this time." MLB.com's No. 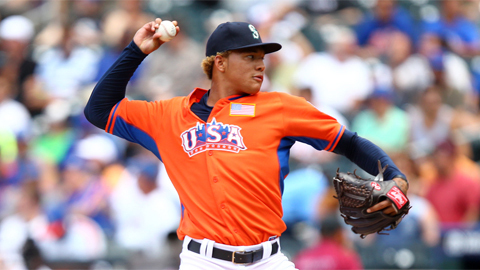 4 prospect Taijuan Walker is one of Seattle's pitchers that will benefit from the move. The 6-foot-4 right-hander went 4-7 with a 2.46 ERA in 14 Southern League starts for the Generals before his promotion. In three Triple-A games for the Rainiers, Seattle's top prospect is 2-0 with a 0.56 ERA. He's allowed just one run over his first 16 innings. "They are both great pitching coaches," Walker said. "They both played in the game for a long time and both know what they are talking about. They have both helped me a lot. Also likely to benefit from the move is 24-year-old righty Chance Ruffin, who has only made one start in Tacoma since moving up from Jackson. Ruffin was 4-4 with a 3.90 ERA in 16 Double-A starts prior to making his Pacific Coast League debut June 12. Other pitching prospects who have played for both coaches this year include left-handed starter James Gillheeney and right-hander reliever Tyler Burgoon, who are both currently with the Generals. Jackson ranks fourth among 10 Southern League teams in ERA (3.32) and strikeouts (690) and first in runs allowed (334). The average Southern League ERA at the All-Star break is 3.57. Tacoma, meanwhile, ranks seventh out of 16 Pacific Coast League teams with a 4.34 ERA, slightly better than the average 4.50 mark. The Rainiers rank third with nine shutouts and fifth with 767 strikeouts. Tacoma has walked fewer batters (302) than every other PCL squad, and they share the overall Triple-A lead with Buffalo. "Right now there is nothing that [Clark] will have me fix -- at Triple-A everybody has a good feel for what they're doing," Walker said. "There is always something to work on, but I'm sure he's not going to mess with me."